Chicken soup is a fall and winter feel-good-food staple. A classic for cold winter nights, a holistic remedy for the common cold (with actual research to back up the claim! ), and a euphemism for feel good vibes (anyone remember “chicken soup for the soul”?). 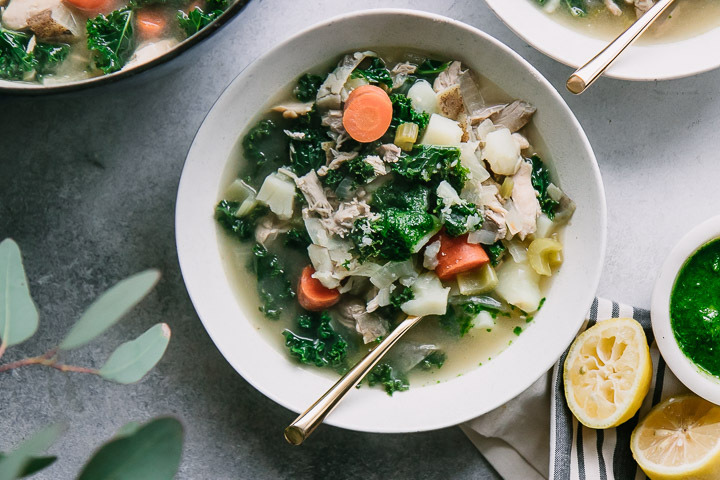 We love a good soup around here and when I found myself with a pound of chicken breast and two quarts of frozen food scrap vegetable broth in the freezer, I knew a chicken soup was in the cards for these cozy winter nights. 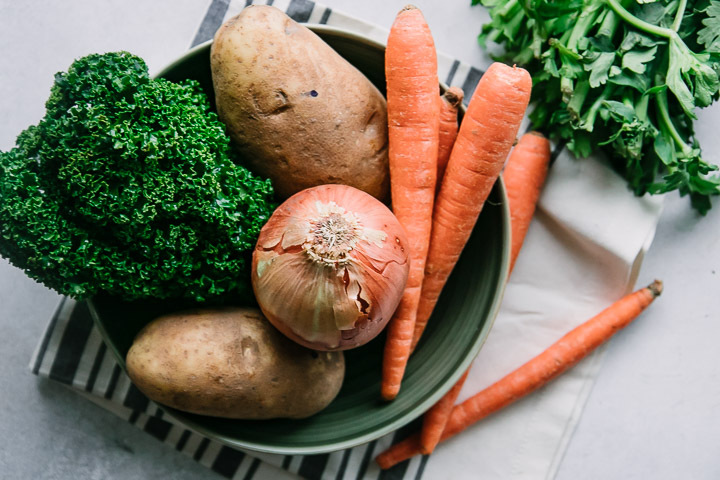 But of course, being a dietitian, I had to throw in as many seasonal vegetables as I could — carrots, onions, celery, and kale — for extra nutrients and fiber. Top it all off with a bit of basil pesto (that I actually had frozen from summer!) and this simple, throw-it-all-in-a-pot soup now became one of our new favorites. 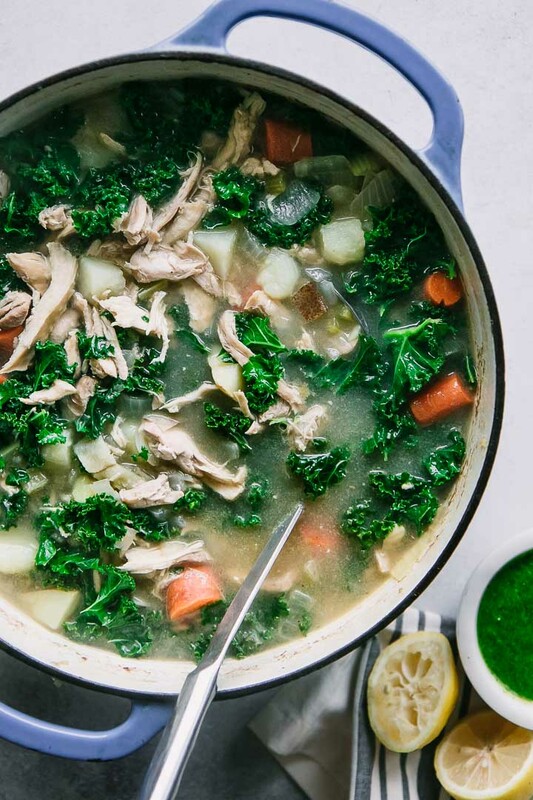 Want the recipe for this simple chicken, potato, and kale soup that’s ready in under an hour? Let’s do it! 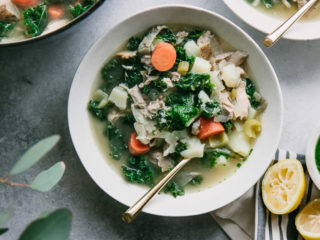 This simple chicken, kale, and potato soup with pesto comes together quickly so it’s a great option for a weeknight meal. It’s also a great recipe for meal prep because the sturdy ingredients hold up well and will be even more delicious reheated after a few days. To make the soup, first heat oil in a large soup pot or dutch oven and saute onion, carrots, and celery until soft. Then add the chicken and sear quickly on each side, and add a pinch of salt and pepper. Next, add the broth and bay leaves and bring the soup to a boil, then reduce to medium and simmer until the chicken is cooked throughout, about 20 minutes. Remove the chicken and let cool, and increase the heat to rolling boil and add potatoes and cook until soft, about 10 minutes. When chicken has cooled, use a fork to shred and then add it back to the pot. Cook for a few more minute and, once potatoes are soft, add juice of one lemon and the shredded kale. Cook for a few minutes more until the kale softens and then it’s ready to serve. Scoop soup into a bowl and top with a spoonful of pesto and enjoy! This simple chicken and potato pesto soup is easy to make, but there are a few tips and tricks to streamline preparation and get the most out of our meal. Love this simple chicken and potato pesto soup recipe? Check out our other seasonal soup recipes, like this Instant Pot Pumpkin Sage Soup or Creamy Vegan Roasted Butternut Squash Soup. 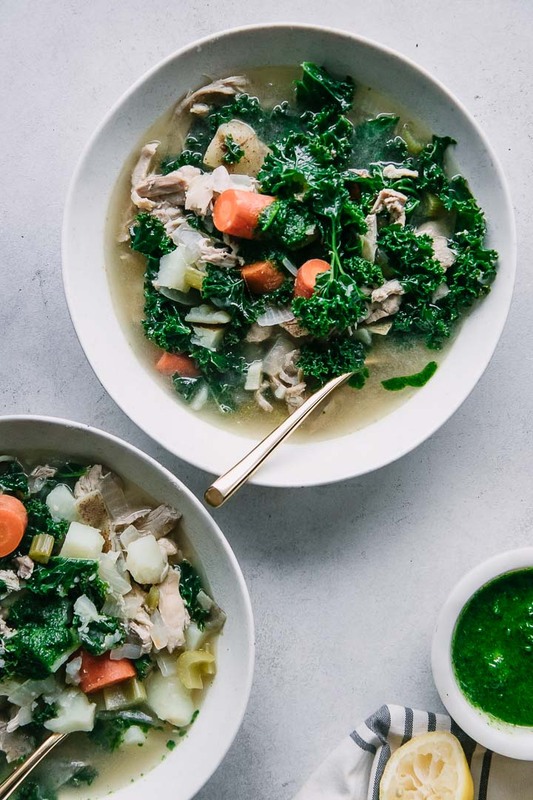 Did you make this Pesto Chicken Kale Potato Soup? Leave a comment below and rate the recipe to let us know how it turned out. 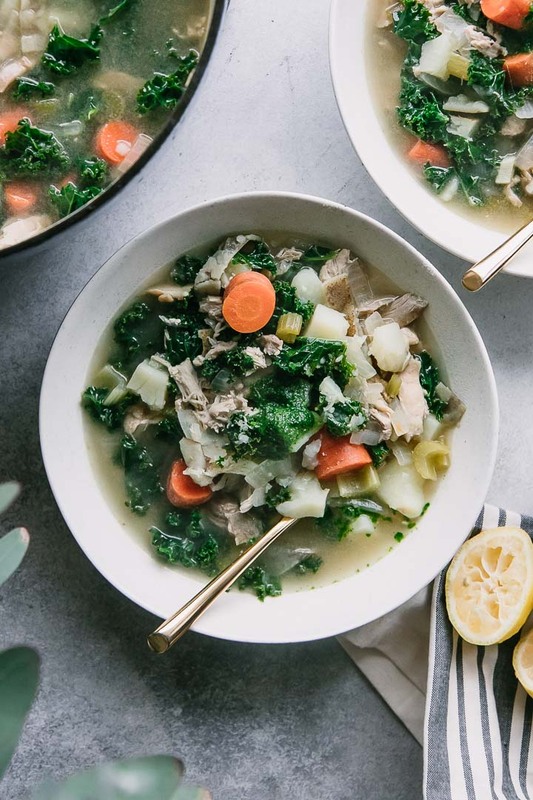 Save this chicken soup recipe for later by pinning to your favorite winter Pinterest board and make sure to tag me on Fork in the Road’s Instagram to show me your chicken soup creations! There’s nothing better than a simple chicken soup, especially with this rainy whether we’ve been having. I’m definitely adding this to my usual recipe rotation. I’m so happy to hear that! And I definitely agree, there’s nothing like a simple chicken and vegetable soup on a winter day. Enjoy!